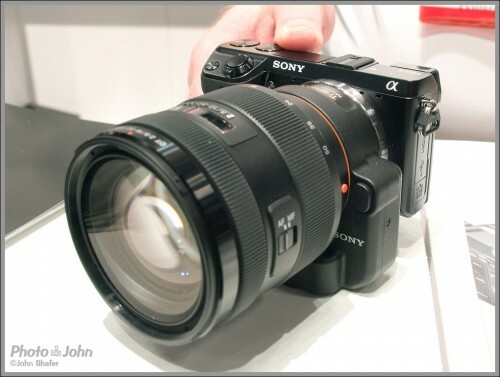 So far, the most exciting camera of 2011 is the Sony Alpha NEX-7. At least that’s what I think. The NEX-7 is a rangefinder-style mirrorless camera with a 24-megapixel APS-C CMOS sensor, beautiful 2.3-million-dot OLED electronic viewfinder, a tilting LCD display, full HD video and a new customizable control interface. To summarize – it’s totally badass. Back in August, when I wrote the announcement article, I said the NEX-7 was my pick at that moment for camera of the year. After getting a chance to play with it a bit at PhotoPlus in New York last week, it’s still my pick for camera of the year. My first impressions were pretty much all positive. The Canon EOS-1D X may be the most powerful camera announced so far in 2011. But the NEX-7 is the most out-of-the-box creative camera in 2011 and I’ll be really surprised if anyone is able to change my mind before the end of the year. 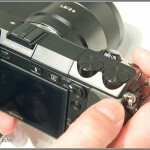 So what’s the big deal with the NEX-7? Basically, it’s a compact-sized camera that delivers full-size camera image quality and performance. I was actually surprised how small it was when I saw it in person at the show. It’s one thing reading a spec sheet and it’s another seeing and handling a camera in person. And the NEX-7 is small. It’s not a pocket camera and it’s not as small as Sony’s other NEX cameras, but it’s still very compact – especially considering it has a built-in electronic viewfinder and tilting LCD. The other thing that surprised me was how solid and metallic the body is. To be honest, that wasn’t even something I’d thought about before I saw it. But I was very pleased when I picked it up and realized how well it’s built. If you’re gonna build a camera for pros, it’s going to have to be solid. And the NEX-7 appears to fit the bill. I was excited to finally get to see and handle the NEX-7 in person at PhotoPlus. I wanted to check out the new custom control interface, the OLED viewfinder and the shooting performance – especially the speed and auto focus. I actually checked out the viewfinder earlier, in the Sony Alpha SLT-A77 and I swear, even though I knew it was an EVF, I still felt like I was looking through an optical viewfinder at first – until I noticed all the data displayed. You don’t get that with an optical viewfinder. One of the Sony reps gave me a demo of the new camera controls (see below) and I think they’re good. [photo] They’re definitely different from what you find on other compact system cameras and digital SLRs and I’m sure there’s a learning curve. But they aren’t so far out there that people won’t be able to learn them. 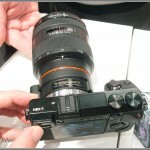 I also played with the entry-level NEX-C3 at the show and I found its controls a lot more confusing than the NEX-7. The good news is that once you get the NEX-7 control system figured out, it’s really quick and efficient – much better than other compact system cameras and very much like the best digital SLRs. Sony had a demo area set up at their booth with all their Alpha SLT and NEX cameras. You had to wait in line to get to the good stuff and I was willing to wait to try out the NEX-7. They were encouraging people to put their own memory cards in the cameras and I tried but the security cable on the camera blocked the memory card door. So I’m sorry, I have no sample photos from the NEX-7. I had to content myself with experimenting with the exposure controls and trying to get a feel for the camera’s speed. Shooting dancers in a small space isn’t a super demanding auto focus task and I don’t have any photos to double-check. That said, the NEX-7′s AF system seemed up to the task and the 10 frames-per-second burst is plenty fast. 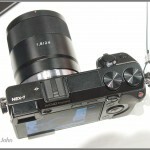 One of the really exciting things about this camera, and the NEX system in general, is the new LA-EA2 Mount Adaptor. 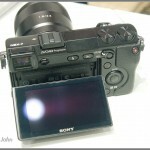 Not only does it let you use the A-mount Alpha DSLR lenses on the NEX cameras, it also adds Sony’s excellent SLT transparent mirror phase detect auto focus system. That means, with the adapter, you can effectively turn the NEX-7 into a digital SLR as far as auto focus performance goes. 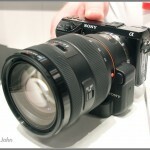 And for video, no other DSLR / mirrorless auto focus system can compete with Sony’s SLT cameras. Read our Sony Alpha SLT-A55 review if you want to learn more about Sony’s translucent mirror and auto focus. My point is, if the NEX-7′s auto focus wasn’t good enough to keep up with the dancers, adding the LA-EA2 adapter would make it good enough. 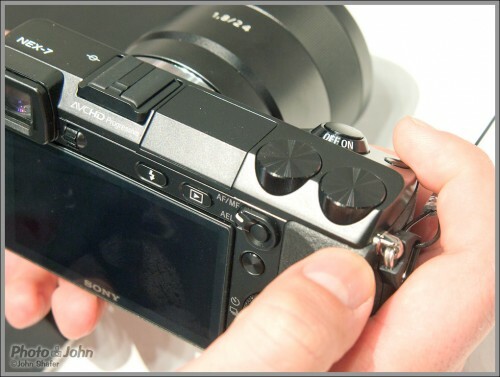 That makes Sony’s NEX mirrorless cameras the most versatile on the market, and puts the NEX-7 in a class of its own. 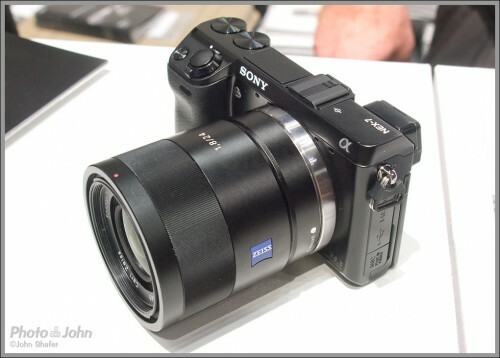 The Sony Alpha folks are anxious to get a NEX-7 and LA-EA2 adapter in my hands for review. I made sure they know that I’m an outdoor action sports guy and small, high-performance cameras make me really excited. 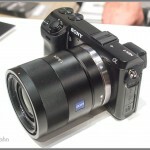 It doesn’t hurt that I’m already excited about the NEX-7 and last year the Sony Alpha A55 was our camera of the year. So hopefully I’ll have one in my hands soon so I can give you a real world report on the camera performance, including auto focus, video and image quality. In the meantime, I hope this article helped you learn something you didn’t already know and I hope you enjoy all the photos of the NEX-7. They’re not as good as having the camera in your hands. But I think they’re more fun than just seeing the studio product shots that come with the press release.